This house is a fairly large house situated on top of the hill, it has a basketball court, which you need to download, and an indoor swimming pool. 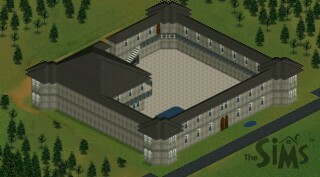 Complete with dance hall and gym! This is a special house because it's designed to look like a castle and it has an interior to match! There is a dungeon, 1 bedroom, bathroom and a huge courtyard. This file is fairly large as, it has lots of objects and decorations in it.